For several years now, sound artists RLW and PAAK have been collaborating on concept albums about subjects such as religion, food, and work. Their album “Zur Arbeit I” was released in 2016 on the attenuation circuit label. It uses quasi-industrial sounds, electronics, and voice to make a point about the status of work in the 21st century. After decades of relatively good social security for working people, Europe now experiences a backlash, with an increasing number of working poor and social stigmatization of people who cannot find jobs. In 2016, there was a heated debate in the local media as home-owners in the neighborhood of the abraxas arts center protested against rent-controlled housing (for unemployed people, among others) being built next to their houses. 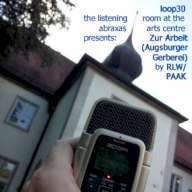 As a statement against this kind of discrimination, the loop30 sound gallery exhibited an excerpt from RLW/PAAK’s album at the center. On the opening night, PAAK did an original live performance on the same subject that utilizes some of the sound sources of the album. Excerpts of this live performance on November 26, 2016 at the abraxas arts center are documented in this release.